Although the vet said it was okay, I haven't fed those things to Loki anymore. I will continue to look up how better to feed him and the vet said that we can focus on converting him to a healthier diet once his weight is more stable and he's healthier. His ataxia is pretty severe though. 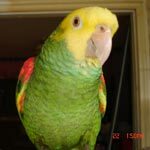 Have you had birds that had severe ataxia and recover from that? The vet stated that since he's been on antibiotics for a week and his ataxia hasn't improved much if at all, that this is the reason why he must be neurologically damaged and that this is permanent. At the moment my biggest concern is getting him to eat. He only wants to eat his millet and he's drinking water just fine. Sometimes he gets these bursts of energy and he tries to open his cage doors or waddles around really quickly and he looks alert. His singing hasn't come back yet but he is able to chirp again and he even said his name this morning!! It's the only word he's ever learned and I never thought I'd hear him be able to say it again so it really made my day. (I've also noticed he has slightly more movement in his wings too.) I've offered him seeds, pellets, veggies, fruits and still he doesn't touch them. I don't know why that is since the vet said that during his week in hospitalization with them he was eating fine and maintaining his weight. Now it looks like his weight is slowly decreasing again. Try making a simple gloop for him by cooking whole wheat couscous and millet together [just a quick boil because they cook fast], add raw steel cut oats [aka Irish oatmeal] as soon as you turn off the stove and, when it's cool, mix some sweet corn [get the frozen kind and thaw it but don't cook it]. I've never seen a tiel that would not like a nice gloop -especially if it's made out of small little round things. I don't know how he moves around but, if he can be upright on its own, put the gloop on a white paper plate at the bottom of his cage [tiels are ground foragers so putting the food spread out on the 'ground' makes it very attractive to them. And add stuff to it that is helpful to him... nutrients like Vit C, betacarotene and Omega 3 are great for the brain so add some veggies that are rich on them to the gloop -like sweet potatoes, butternut squash, carrots - you can also use a bit of salt-free tomato paste in the water where you cook the grains for a great antioxidant boost. If he won't eat them chopped up, get the pureed ones from the baby food aisle and mix them with the gloop [but don't make the gloop too 'gloopy' -as in 'sticky' or 'wet'- or he might not like it -at least, my birds wouldn't]. Flax seed meal srpinkled on the gloop will take care of the Omega 3. And let's not forget the supplements that boost/repair brain functions like DMG [a miracle supplement for brain damage, if you ask me and one I have used in the past very successfully with birds that had neurological problems!] and because the brain is an oxygen hogger, CoQ10 will be beneficial. Also [VERY IMPORTANT!!!! ], he needs to be kept at a strict solar schedule because melatonin has a profound effect on brain function, cell regeneration and the immune system so he needs to be producing it in normal levels and the normal way which can only be done through a strict solar schedule with full exposure to dawn and dusk with complete darkness at night. Quality sleep is what allows our cells to regenerate and repair AND to establish and remember cognitive functions so he needs to on a bird light schedule and not a human light schedule which would weaken him and not allow him to get better. Well hearing that gives me some hope! I pray that he gets better than this. I appreciate that gloop recipe for him! It helps so much to have spelled out easily and I immediately went out earlier today and I bought all of those ingredients and managed to feed him some. He's not eating his other seeds/pellets except the millet seed. I only got him to eat the gloop because I had to hold it up to him and steady him to eat. If he leans too much forward he completely tumbles over. I don't know if this is the reason he's not eating as much as he should be. I will attempt to get him on a solar schedule. They share the same room as me since I live with my family and I spend most of my time in there. I have been covering them and turning out the lights earlier every night though. Besides the eating situation I am also worried that he's now pulling out feathers from his back/wing areas that are not old ones. They are still fresh and have the little moist part (I don't know the actual name) and are still in the shaft. I'll attach a picture, hopefully so you can see. I've not seen this before so I don't know what it means. Another concern I’ve just noticed too is how he behaves when I turn out the lights and cover him for bed. He suddenly has energy, is wide awake, and he starts climbing around as though trying to get up higher and juggling the cage doors. He just climbs from one end of his cage to the other. I worry he’s expending his little energy just doing that. Yes, he is plucking his pin feathers - did he pluck before or is this a brand- new thing? Not much you can do about it because, let's face it, the main concern now is to keep him alive with a reasonable quality of life. Turning off the lights and covering the cage doesn't do it - and that's why he is moving around inside the cage after you do it -because he is still wide awake. They need to be exposed to the different light that happens at twilight. During dawn and dusk, the light of the sun hits the atmosphere at a steep angle making it refract differently than the rest of the day and it is this special light that happens at the beginning and the end of the day the one that tells their bodies what to do. This time of the year, I turn off the overhead lights at 3 pm, feed them dinner at 3:30 pm and cover their cages only after night has fallen completely and they are all already asleep. As to his eating... well, you are going to have to come up with a way of him staying upright on its own and putting his food right in front of his face so he can eat it without toppling over. Why don't you try to make him a 'stand'? Maybe something like a paper cup you can cut down to the length of his legs so his body stays supported by the rim of the cup [you should 'line' the edge with something soft so it doesn't 'cut' into his body], his legs are stretched out under him [which would also allow him to move them a bit without having to support his weight] and put a flat dish on a stand at precisely the same height as his face so he can eat 'standing up' without falling [this is what I did for the blind, paralyzed female I had -her name was Hellen- and I used a water dish support -the kind that is a metal ring that supports the rim of the bowl only I did not use the bowl but a little flat stainless steel dish sold for cat food in it]. You will have to supervise him all the time he is eating but they mostly eat twice a day [although, in his case, I would give him extra at noon], at dawn and at dusk, so it would not be too difficult. And it is always better to make it so they can do things on their own. You just have to make sure that the diameter of the dish is the one that would 'work' with the ring. I use these dishes a lot with my birds. I use them for the produce [like blackberries, bluberries, grapes, Brussels sprouts, sugar snaps, etc] for the large species and for the gloop for the small ones. Yes the plucking is a brand new thing. He doesn’t do it often though so that’s good I suppose. So far I’ve been having him sit on my chest to eat off of me and he eats a lot when I do that. I think the angle of me lying on my bed on a bunch of pillows helps him reach the food without toppling over. That’s a great idea with the cup and the flat plate. I have a flat ceramic plate for him already (also one meant for cats) but that’s what I lay in his cage that he doesn’t touch so you’re definitely right about bringing it up to his level to be able to eat from it. I’ll try all these methods to see if one works for him. At least he’s good with his water. It’s one of those where it fills itself as it’s drunk from by hanging upside down and has an opening with a small bowl to fill under. It has a built in perch right where his chest is so it helps him lean onto it to drink. Tonight I’ll try with not turning any lights on and letting the window be open to the natural light to see if that helps. That would explain why he’s awake when I turn out the lights and all but all through the night he wakes up and does his climbing around and jiggling the doors. He does it roughly every 2 hours and that’s how we’re both not sleeping well at night. Can this also be because of the light situation? Is there any light shining in your room? Because we, humans, don't really notice a little bit of light coming in through, say, a window that faces a street lamp or a TV screen or whatever because, once we close our eyes, that's it for us. But birds have photoreceptors [the cells that 'sense' light] in their brains [humans and all other mammals have them only in the eyes] and are much more sensitive to light than we are so try covering his cage with a black out material [you can use something thick like a quilt, for example] once it's completely dark and he is roosting making sure no light shines into the cage. When I first move back to New Jersey, my tiels were having night frights - something that had never happened before and I couldn't figure out what was causing them until I slept in the birdroom one night and realized that their cage was getting a sliver of light from a street lamp that was accross the street at the corner. Once I started drawing the blinds close when night fell, they slept all night long without a problem. Set him a place at your table or move his cage near you when you eat. Share things off your plate,things he is allowed to eat should be what you are eating, then move the food off your plate to his. He will watch you eat. Birds eat in flocks watching the others about what is good. Many people say that their diet is better because they eat with their birds. Rainbow does not eat things like tomatoes or anything red. He watched me eat a pomagranted and wanted his share. Now he loves them. He does not like leafy veg but gets part of my salad before I add dressing. Typically my room is very very dark. I have double blinds and extra thick darkening curtains at night so nothing gets in. After some trial and error though, I think I might’ve found the solution. I know you said the human light schedule isn’t good but I feel that I’ve got it figured out. The other night I was in bed in the dark trying to sleep as usual and he was climbing and awake as usual. Then I turned on my phone’s flashlight because I dropped my water bottle off my nightstand and couldn’t find where it rolled to. Then I noticed Loki stopped. I turned the flashlight off again and Loki again started moving around and doing his thing. I turned the flashlight on, he stopped. Off again, and again he started climbing. I did that for 30 minutes. I figured either he was doing it to get my attention or he liked the light. So I grabbed the nightlight he used to use and turned it on and made sure he could see a bit of the light from his cage. And the rest of the night he was peacefully asleep. I tried it again the next night to make sure it wasn’t a fluke and yup, he was asleep nice and peacefully again all night. So it’s not following a strict solar schedule but it looks like the night light works. He used to need it due to his night frights and I would use it for years until recently once I moved back in with my family 8 months ago. I guess he suddenly needs it again? But I worry that it’s not good for him even if he’s finally sleeping at night. And Liz, I will definitely do more of that eating with him. Every now and again I notice that I’ll have something he usually doesn’t eat and he’ll be interested. I’d love to get him to eat more vegetables so I’ll gice it a try. When you have an itchy place you scratch it and sometimes make it worse. I have a wild idea for the plucking. If it was me I would use red palm oil on the places he is plucking. It won't hurt him and it will stop the itch. I have to use it on Phoenix's nub. When it gets dry he picks it bloody again. Keeping it oiled, he will leave it alone and the red palm oil won't hurt him if he does try to pick. Well, the nighlight is a real bad idea, my dear. Below I am giving you links to studies that show that exposing birds to light at night messes up their endocrine system something terrible! And, in case you are not aware of this, a messed up endocrine system means a messed up immune system and your bird is already so fragile that, if I were you, I would not risk making things worse. As I explained before, you can't expect a messed-up endocrine system to go back on track from one day to the next, you need to give it time -sometimes, months!.